This photo is currently for sale in a lot of Beatles photos at Sotherby's Auction House. It has been causing quite a stir among Beatle fans. No one can pinpoint where the photo was taken. From the best we can tell the photograph was either taken in very late 1967 or early in 1968. Suggestions as to where the photo was taken? India? A night club with a Moroccan theme? A secret trip John and Cyn made to Morocco? What do you think of this mystery photo? It was taken in January 1968 on the trip to Morocco that John, Cyn and Victor Spinetti made when John and Vic were working on the Lennon In His Own Write play together. Not sure who the person is with them or if it was Victor who took the pic. Retouched version of the Sotheby’s auction photo of Cynthia, John and unidentified man. I think this is from the brief spur-of-the-moment New Years 1968 holiday to Morocco on which John invited Victor Spinetti after saying he was cold and wanted to go somewhere warm. 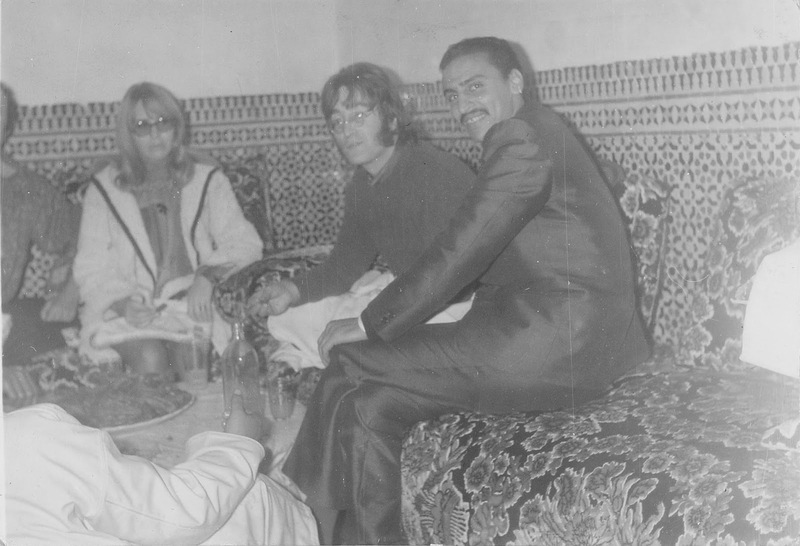 John, Cyn and Victor flew from London to Casablanca, Morocco on December 29, 1967 and spent New Years in Marrakesh. also has some important information! Yes---very cool! I thought I recalled something about John in Morocco, but I couldn't locate the information to verify it. John's postcard sent to Ringo from Morocco is in Ringo's book. Actually, looking again, looks like Victor has been cropped out of the photo - or was out of frame - to the sharp left of the pic (next to Cyn).